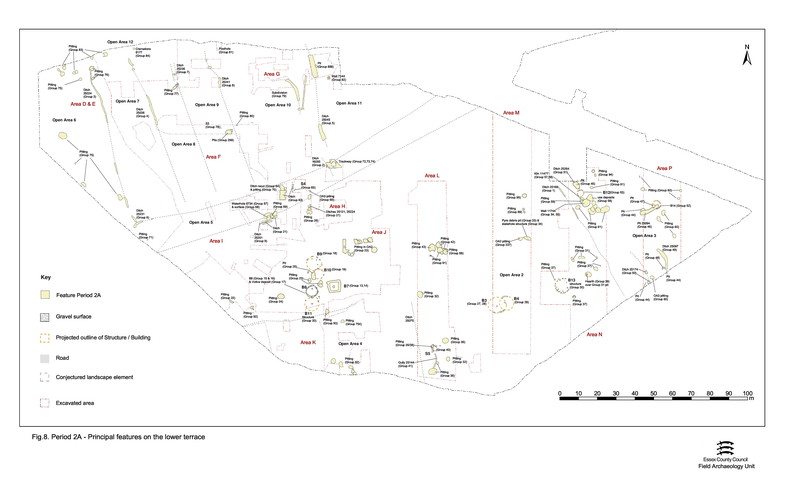 While the stratigraphically earliest activity is described in Lower terrace (south), identifiably later Period 2A ditches, structures and pits within Open Area 3 are described below. Ditch 25174, previously surmised to define one side of a possible trackway running away from OA5 and south toward the salt-marsh, passes out of use in the latter part of Period 2A. 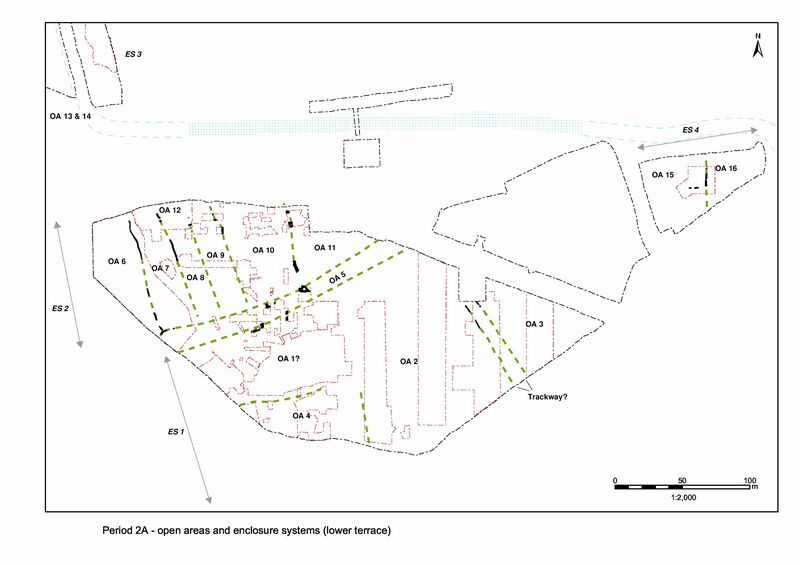 It is assumed that the area of the trackway is subsumed into the interior of OA3 and is occupied by a range of structures and activities that includes processing or metalworking in the form of Kiln 1. 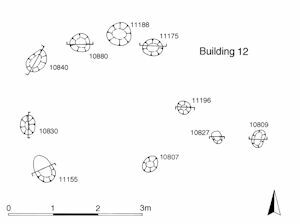 Building 12, in the north-western investigated part of OA3 (in Excavation Area N), is a small circular structure consisting of nine post-holes in total (10807, 10830, 10840, 10880, 11155, 11175, 11188, 11196, plus one un-numbered). These define a 3.5m diameter circle, with an internal floor area of c. 8.25m² and a possible entrance gap at the south (Figure 21). The fills of its component features include only a few sherds of Late Iron Age grog-tempered pottery. Given its small size, Building 12 can perhaps be regarded as an outbuilding or, given the location of Kiln 1 (see below) immediately to its south, a workshop, rather than a dwelling. Kiln 11477 (Figure 30) is a small structure constructed in a sub-rectangular cut, the primary fill of which (11465) contains micaceous terra nigra that can be tentatively dated to the early 1st century AD. Only small fragments of the kiln itself survive as an in situ burnt clay deposit, probably defining the position of the kiln walls and perhaps a central pedestal. As part of its construction, the slump hollow over infilled Well 11744 is lined with clay (11408). During the use of the kiln, gravel surface 11370 is laid in the hollow which is then used as a stokehole/rake-out area. Charcoal-rich silts within the hollow contain small amounts of slag, crucible, and metal lumps - perhaps cast waste. Fragments (almost 7kg) of 'kiln material' are also present and presumably derive from the degradation of the structure itself. 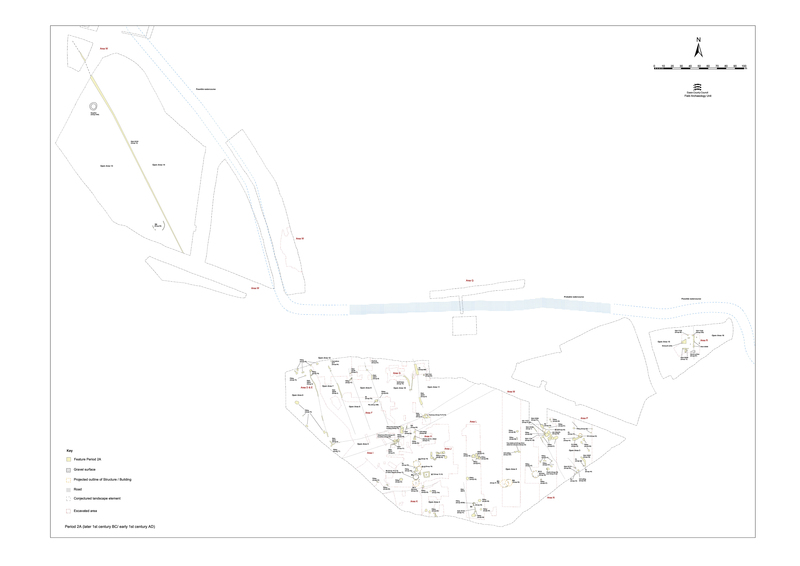 It is apparent that the sequence was not fully clarified by excavation: adjacent pits 11342 and 11387 (Group 58) in particular seem to be related to the use of, or modifications to, the stokehole area. As recorded, these occupy a curious stratigraphic position; pit 11387 seemingly post-dates the Kiln 11477 construction cut, but is itself cut by 11342 which in turn is sealed by black, charcoal-rich fill 11294 - the latest deposit relating to the use of Kiln 1, extending out of the stokehole. Consequently these features are treated as related to the use of Kiln 11477. The pottery from the fills of pit 11342 (KPG4) indicates a date at the end of the 1st century BC while that from other use deposits within both kiln and stokehole gives an early 1st century AD date. 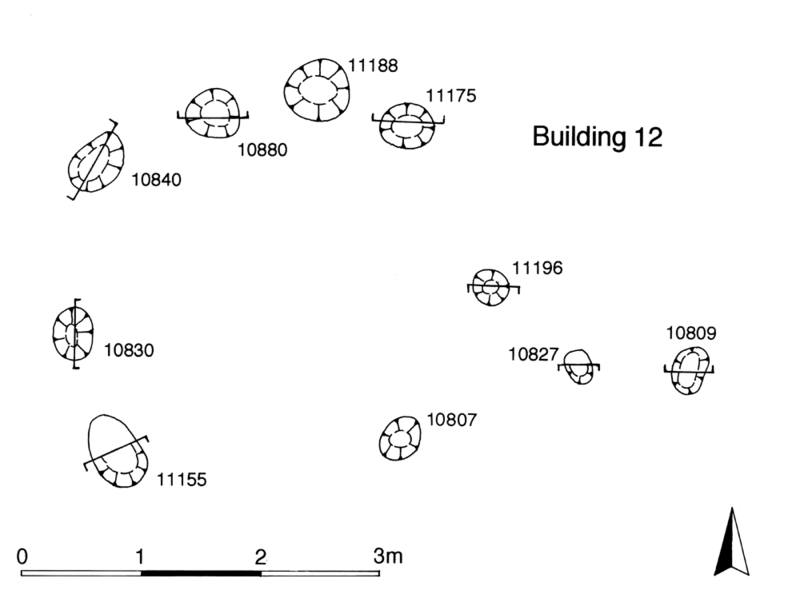 Hearths 10894, 10895, 10929, 11045, 11050 (Group 205, shown on Period 2B plans), to the east of Building 12 and Kiln 11477, cannot be sub-phased and it seems that some form of metalworking activity is carried out in this vicinity throughout Period 2. The hearths are defined roughly circular patches of burnt clay and concentrations of burnt pebbles, each no more than 1.5m across. Only 10894 includes datable pottery (of late 1st century BC to early 1st century AD range, albeit based upon a single diagnostic sherd). While pits 11342 and 11387 (Group 58) are judged to be contemporary and perhaps associated with Kiln 11477, the kiln is post-dated by pits 11167, 11344 and 11463 (Group 59). Small amounts of slag or metal waste are present in a number of these Period 2A pits, the largest quantities being 577g in 11167 and 410g in 11342. 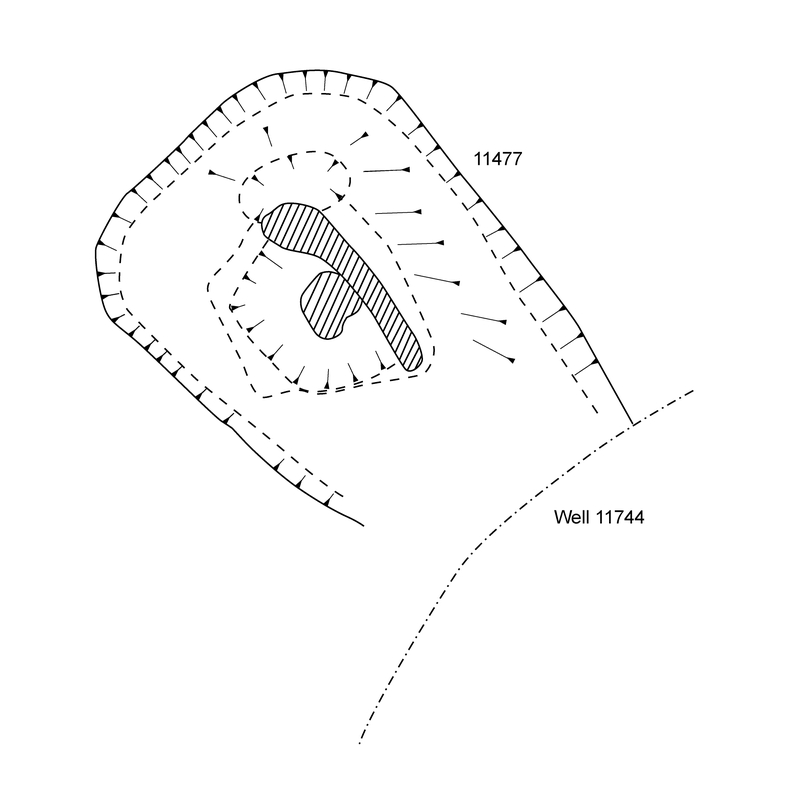 Small fragments of crucible are contained in 11344 and the fills of Well 11744 subsidence hollow 11745, derived from its reuse as the Kiln 11477 stokehole. Although meagre, these finds may suggest metalworking at Kiln 11477 or its near vicinity (see also Craft and Manufacture). Pit 10871 (Group 206) lies between Building 12 and the hearths. There is evidence for continuity of use in this part of the site into Period 2B (see Group 207), as similar pits and hearths continue to be located along this enclosure frontage. Other pits, Group 60 lying close to the kiln and Group 61 situated further east and south, could be contemporary with Building 12 and Kiln 1. There is little distinction in date between these and the Group 59 pits more closely associated with the kiln - both include grog-tempered pottery and Gallo-Belgic imports dating to the late 1st century BC-early 1st century AD. Three of these (8586, 8755, 19023) also include assemblages that could be earlier in the Late Iron Age (see Pit Groups 46 and 48). Other finds are noticeably rare, amounting to only tiny quantities of briquetage, animal bone and daub or baked clay. Unusually, almost no metalwork other than a copper-alloy brooch (SF6989) and pin (SF6993) from 11385 is present in the fills of these pits, and only 19162 has 1g of hammerscale. A late Roman coin in 11397 must be intrusive, while another coin present cannot be positively identified. Pit 19104 (Group 47) post-dates elongated pit 25094, and is unlikely to be any earlier than early 1st century AD. In the southern part of OA3, ditch 25097 (segs 8663, 8735, 8772) may represent subdivision of this end of the enclosure. 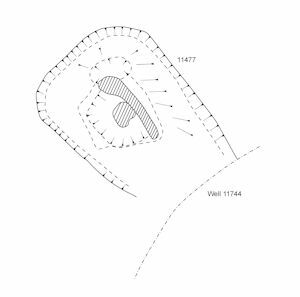 It is a curving linear feature some 13m long, with a clearly defined southern terminal. Its northern terminal is obscured by a pair of inter-cut pits (8713, 8732) of prehistoric date. Pottery in segment 8663 provides an early to mid-1st century AD date (a considerable amount of Roman ceramic building material, derived from a capping/backfill of its slump hollow, need not affect this date). At 1.0-1.8m wide (widest at its mid-point) and up to 0.40m deep, 25097 is a relatively substantial feature within the contemporary landscape. However, its function is unclear. Its curved alignment may suggest that it represents the position of a shielding fence or hedge for a structure or activity undertaken to its west. The curvature of the ditch reflects that of ditch 25174 to its east and the two may be related.